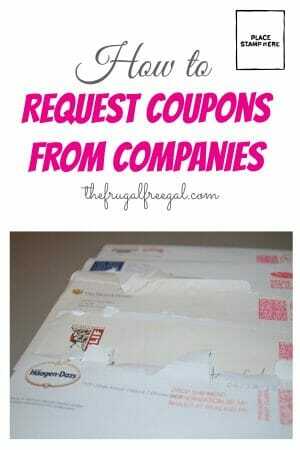 HOW to WRITE TO COMPANIES for COUPONS! Do you want to receive FREE coupons in your mailbox? Did you know that groceries are one of the biggest expenses in most households today? Coupons are a great way to save money on groceries. You can find printable coupons online, digital coupons, and even Amazon coupons! Get $10 at Ibotta when you sign up through my referral link! You can also request coupons from companies and ask companies to send you coupons in the mail! Keep reading below to see how YOU can request coupons from companies! I have been writing to companies online asking them to send money saving coupons and/or free samples of my favorite products to me in the mail. So far, 6 out of 7 have sent me coupons. I received 4 letters in the mail from companies and 2 emails back with coupons. Only 1 company did not send coupons. I have written to several other companies as well and plan to continue doing this so that I can save money this year! While you are here, see how you can get freebies in your mailbox, too! Go here to see how many other coupons I scored from companies! 1. Go here to find a HUGE list of companies and stores to contact. Click on your favorite companies and find the box on the right side. At the bottom of the box, you’ll find the company website. Click to go to the website. 2. Find the “Contact Us” link on the homepage. 3. Fill out your information. In the comment section, tell them about the product you like and why you like it. 4. In that section, ask them if they could send money saving coupons and/or free samples for you and your friends. Submit. 5. Repeat this process for the other companies. 6. Check your mail box or email in the next few days and weeks to see what the company will send you. 7. Leave a comment here if you have any luck! Don’t want to wait for coupons? Print coupons now! Not at all! It is easy and well worth the time. Start slowly, writing to about 2-3 a day. Then add more once you get used to it. It can be fun to because you never know what they will send you. Sometimes you will get free items–Luna sent coupons for 2 free bars! What companies do you plan to write to for money saving coupons? Another great way to save money this year is through the use of coupons. You can print coupons, take advantage of digital coupons, find coupons in your local newspapers, and most of the freebies that arrive in my mailbox include high value coupons. Check out all of my past mailbox freebies. If you are interested in receiving freebies with coupons, then read this article on how YOU can sign up and receive freebies, too! Glad to hear this! It’s fun to receive coupons in the mail for our favorite brands! I havent contacted several companies over the years and told them how much I liked/appreciated their company/products.I never asked them for anything,but a majority of them sent me very nice coupons,many were for freebies or BOGOs.You can also find the company info on the box/package. I know when I would specifically ask for coupons/samples in the comment section, they would always come back with “No, we don’t send coupons and/or samples because they are available in newspapers or other sources.” But, if I emailed the same companies with strictly how great their products are, they would more likely to send coupons, samples, and recipes. This is true! Thanks for sharing! It doesn’t hurt to try! My family has many food allergies, so we are limited to brands that either never have coupons or it is extremely rare. So I write to them on a regular basis, about every three months. Some companies have policies that they are not allowed to send coupons more than once every six months. This has worked extremely well for our family, since our gluten free, dairy free, and soy free life style is very expensive. Last shopping trip I was able to use $25 in coupons that rarely if ever show up on line or in papers! I wrote to skinny cow and they emailed me back the very next day. They are sending me coupons. That’s great news! Glad it worked out for y’all! Emailed the company that makes the Aunt Jemima products and they wrote back stating they are sending coupons in the mail. This was a same day response. This is a good thing to learn. There are certain products I like to buy, but rarely see coupons for. I’m going to give it a try. Tillamook cheese, edys ice cream, fresh pet dog food, michelinas amd blue diamond almonds have all sent me coupons.